Just Say No to Kiddie Perms Disguised as Hair Softeners! While we knew most children’s relaxer treatments as “Just For Me” back in the day, kiddie perms these days are being disguised with the terms ‘softeners’ and ‘ curl looseners.’ Updated product names and refreshed marketing language that mesh with the terminology of the natural hair care community grace the boxes of products that chemically alter the state of a little girl’s hair. I get it—expand and grow the demographic. These products, however, send the same negative messages to little girls about their hair. Putting harsh chemicals on a 3-year-old’s head warrants an immediate side-eye. And though chemical burns heal and scalp irritation subsides, those scars to the self-esteem of young girls remain. By sending the message that the way she looks isn’t fine and good through the use of such products, as mothers and guardians, we run the risk of having our girls continue to carry such a false belief, which can turn into years of feeling ‘not good enough’ and ‘not pretty enough.’ Altering the texture of a girl’s hair at an early age pits them against their peers in yet another unhealthy competition and comparison. Don’t be fooled by the new marketing speak of these rebranded products. Instead of slapping the Boxed Kiddie Perm 2.0 on our daughters’ heads, let’s encourage them to have a healthy case of Hand-in-Hair Syndrome. Let them play in their hair, feel it, get familiar with its quirks and be excited to learn about how to care for it. Learning to care for natural hair at a young age is a definite bonus because she’ll have a foundation of knowledge about her hair for whatever style she rocks in the future. When she is old enough, she can choose how she wants to style her hair—be it with a relaxer, natural, braids or otherwise. She’ll be empowered with enough practical know-how to weigh the pros and cons but also know her hair’s unaltered texture and behavior. Girls and women should know and be able to easily recall the texture of their natural hair. It’s disheartening to hear a woman say she doesn’t know her true hair texture because she has kept up with a choice that was made by someone else to alter her hair many years ago as a child. It’s just another way of quietly stripping away the person she is by permanently changing her look and by taking away her choice. 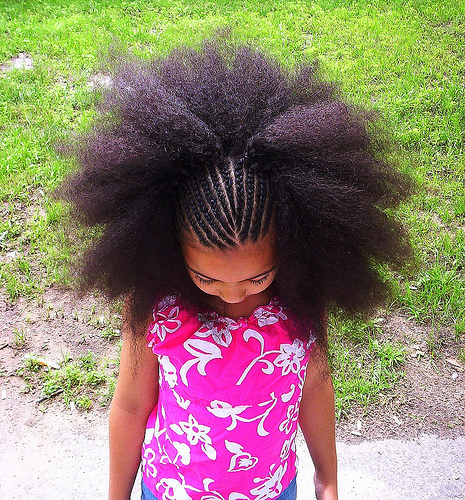 There is no reason a girl at six or seven years old needs a ‘treatment’ for her hair with all the information out there now about how to care for natural hair of a wide variety of textures. There’s nothing wrong with finding ways to shorten styling time, especially for a young child who wants more play time on Saturday night rather than sitting around getting their hair washed, combed and braided for Sunday morning. There is, however, an issue with sending the message that our girls aren’t good enough the way they are. Instead, we should encourage our girls to love their hair, and themselves, by learning about character, caring for hearts, feeding their minds and feeling carefree about the way they look. No alterations needed. Writers’ Haul: Some goodies I picked up. So y’all hear me carrying on from time to time about calling myself a writer and such. In an effort to provide some proof of the jump-up-and-down joy that overcomes me in bookstores, art stores and in the pen and pencil aisle of office supply stores, I present to you goodies from a writing haul! YAY, notebooks!